Rebuy it? Maybe. Why? I really liked all Balea shampoos I've used so far even though I never really saw them making a difference. I might repurchase this one nevertheless as it's silicone free and doesn't cost much. Rebuy it? Probably not. Why? I got this one as a gift in a goodie bag and really liked it. It separated my lashes perfectly and gave them a nice fake lashes look. The brush had a perfect size, too. However I still have 3 other mascaras waiting to be used so I will probably make it through 2015 without buying new mascara. Rebuy it. I wish I could! Why? This shower gel was a souvenir brought from Greece so I won't be able to repurchase it even though I would love to! The smell was just so amazing and have you looked at the cute packaging? Also the shower gel is made from organic products, it contains no parabens, no silicone, no propylene glycol and no mineral oil. Jackpot! Earlier I tried to take a look at their website but it doesn't work anymore which is really sad as I would have loved to find out if the products are being sold internationally. Do you know the brand and could tell me more about it? Rebuy it? No. Why? As you might guess this scrub was still from last winter and it was inside the Ginger Sparkle box I had gotten myself. However it was a rather soft scrub with small grains which I don't like that much in a body scrub. Also the clasp was hard to close which was super annoying. What have you guys been emptying lately? Have you been able to try one of the above products? At the moment I'm reading a book about cosmetic ingredients that are bad for your health so if I let the book convince me I might not be using any of these products in the future but I don't think I will have the willpower to switch to risk-free natural cosmetics only. Have you gained experience in this field? Nice stuff! I've been saving up my empties from the last two/three months for a post! I love how you guys have such great fruity scents of body gels/shampoos over there! 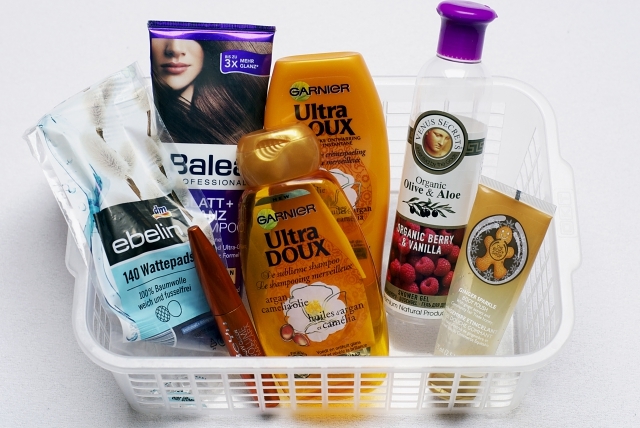 I think I have tried the Garnier shampoo once but haven't rebought it... mainly sticking to Elseve. I have never heard of BeYu but since you gave it a good review, I will look out for it.